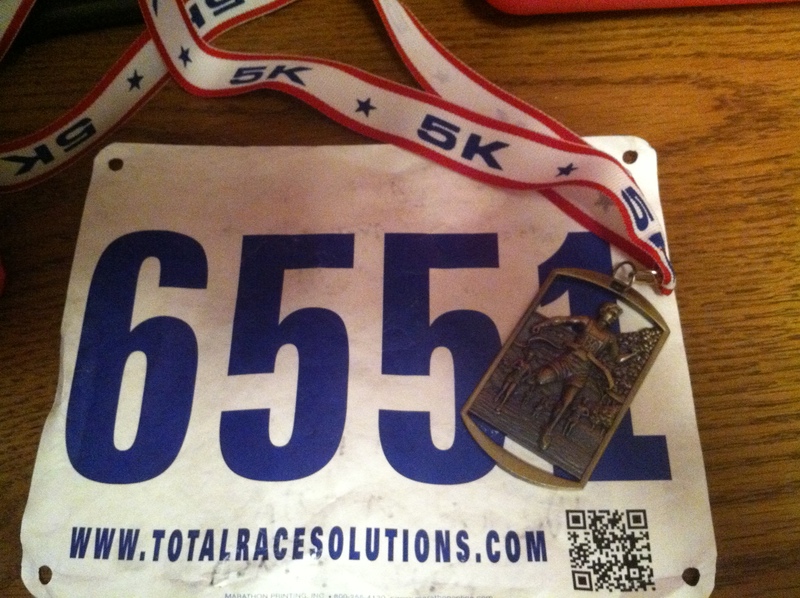 When it comes to races, I am all about the bling. I will gladly travel outside of my area code for a smaller race if it means some kind of special prize or perk. Last year, my best friend Ashley and I did the Cove Lake 5k. We knew it was a smaller race and every finisher got a medal. This year we decided to do it once again for my June race. The fact that they had watermelon as post race food last year may or may not have been a factor in our registration decision. It was a bit of a drive to get up to the race, but traffic was good and I enjoyed catching up with Ashley since I have not seen her since my graduation. After getting to the race, my race packet wasn’t there. I was able to talk to the timing lady and race director to get things smoothed out and was able to still get a big and t-shirt. We were there a little early so we took shelter behind a big mulch pile so I could get my “warm-up” in. Before I run I like to do a lot of dynamic stretching that ends up making me look like an idiot but it works for me so there better be no side eyes from faster runners. Ashley and I chatted about our goals for the race. I really didn’t have any other than beating my time from my last 5k but her goal was to run the entire race. Easy enough, huh? We lined up and with a quick gun blast we were off. The race starts on a slight downhill then makes a sharp turn for a gentle uphill climb. We had to bob and weave a lot but we weren’t in a major hurry so I really didn’t mind. After about a half mile the course went onto a paved path in the woods. It was nice since it shaded us from the sun but the ground was quite slick and the air was muggy. I was thankful this wasn’t a big race because it definitely could have been congested in this area. Around the 1 mile mark I told Ashley that I was going to stop but that she had to go on. She took off and I took a walk break (the first of many). The course wasn’t hilly but it wasn’t flat either. I tried to make up time by running faster on the downhill but I don’t think it did me much good. After coming out of the woods we had to run around Cove Lake then make an ascent up a long hill. Since the lake is so spread out, I was able to see Ashley way up in front of me so the goal was to catch back up with her. I ended up using this time to take walk breaks but run fast when I did run. Right before the hill I finally caught Ashley and I yelled “KEEP GOING”. She had ran the entire race so far and was crushing her goal. As soon as I yelled I took another walk break. It was pretty discouraging having such slow split times and having to take so many walk breaks after working so hard on the track last week. But I know that a race time isn’t a reflection of who I am and some days you just don’t have it. The hill was brutal but I knew that once I hit the top of it then all I had was a left turn through a tunnel and a right turn to the finish. I ran as soon as I saw the tunnel and passed a lady who was walking. I gave her a gentle nudge on the back and said “You gotta run; we are almost there”. She took off and the competitive side of me said OH HECK NO so I took off too. We were neck and neck in a full sprint to the finish line and I think I barely beat her. 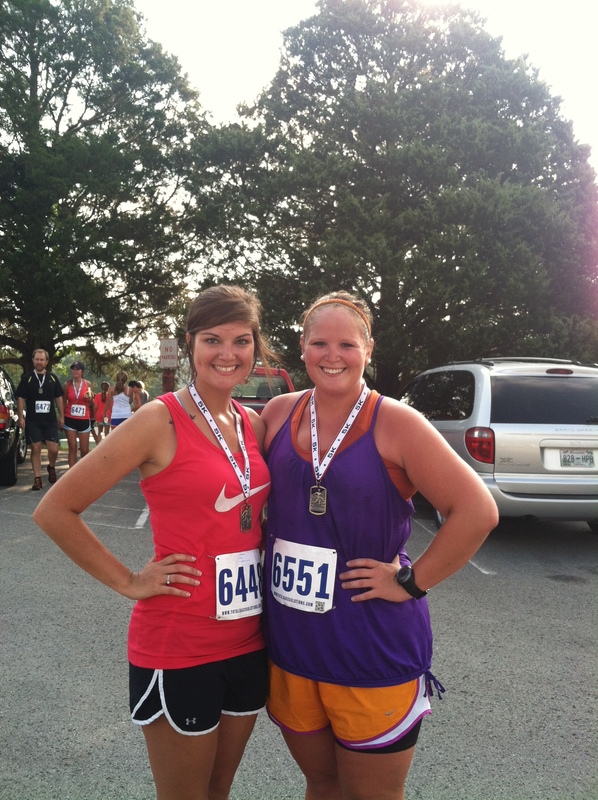 Ashley ended up finishing 15 seconds ahead of me and ran the entire race!! So proud of her. We got our medals and I just laid down flat in the grass. Who knew a 5k could be so difficult. After spending a good five minutes breathing we headed over to the pool area to get our share of watermelon. I swear there isn’t anything that tastes better after a hot race than watermelon. Hint hint to all race directors. Our bibs had one of those smart phone scanners on them where you could see your results instantly. I was so thankful for this because usually I stick around for the awards just to hear how fast the girls in my division ran it. Thankfully the scanner was able to tell me my place, pace, and everything. This saved a lot of time. 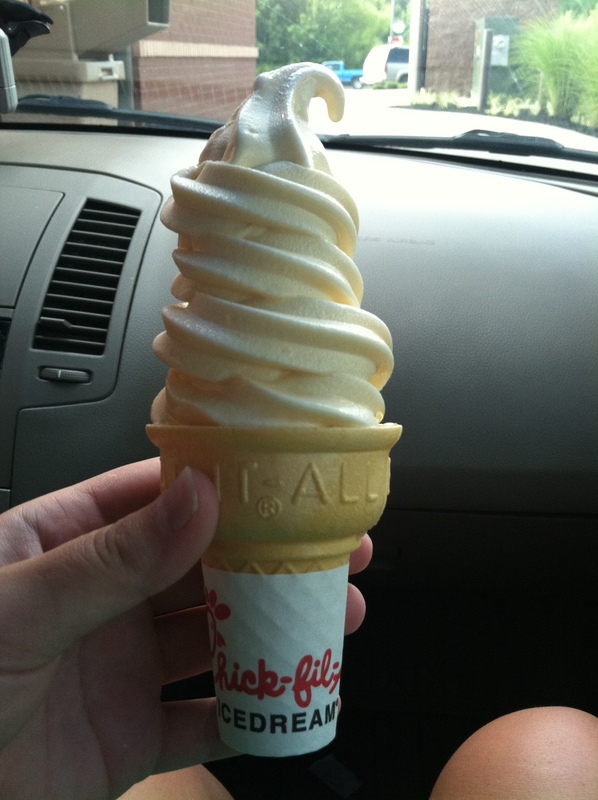 On the way home we stopped at Chick-fil-a for ice cream. Because that is what summer is all about. While I may not be pleased with my time, I am relatively pleased with my effort and SO PROUD of my best friend for not only doing this race but for running the entire time. That is something to be proud of!! I have my medal and that’s all I need. Also…go congratulate my favorite running buddy Brittney who placed in her age group at her half marathon this weekend. She did that on three hours of sleep and a two week long trip to Alaska. What a beast! 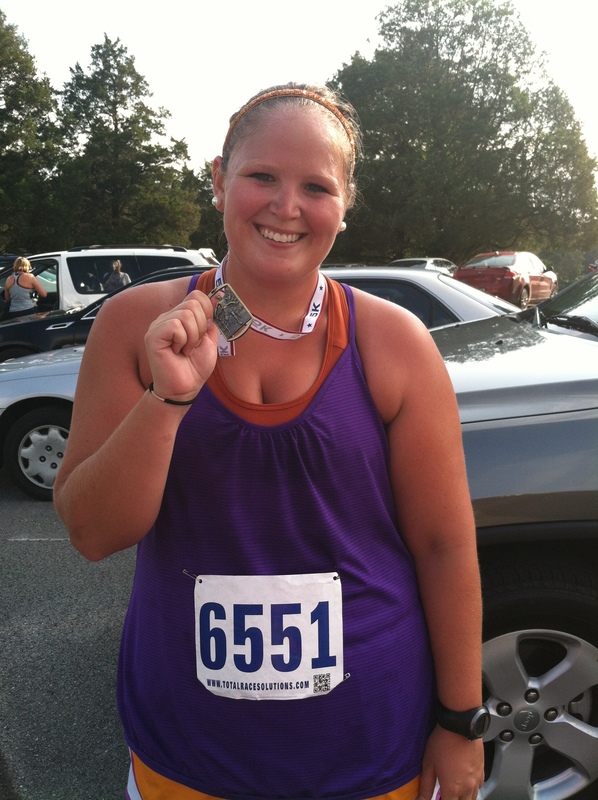 This entry was posted in Race Recaps and tagged Cove Lake 5k, fat girl runs, local 5k, race recap by thegogirlblog. Bookmark the permalink. Great recap! Sounds like fun! Love the medal 🙂 congrats to your friend too!!!! Way to motivate others!!! You must have really run your intervals at a fast pace, to finish only a little bit behind Ashley, who ran the entire time! I love running races I’ve done before because they get a little easier every time. Congrats! !